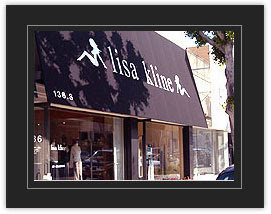 The famed Lisa Kline online boutique close shop on Jan. 15. The shop known for it's high-end brands and celebrity clientele is suffering just like the rest of the country. Now I'm not sure that this is the exact reason for the online store shutting down, but I can imagine it's potentially due to poor sales. The site launched back in Feb. '08, less than a year ago, and I had the pleasure of interviewing the woman behind the successful brand. You can check out the post on Beauty Chat. In a time when people aren't splurging a lot, it makes sense that a pricey retailer would not be doing so well. I do hope that her flagship Robertson Blvd. store, along with the others, do OK.
aww thats sad to hear. :( specially since you even interviewed a mere year ago..
:( Sigh. I hope the economy picks up soon! oh that is sad to hear. i think this bad economy is hitting everyone. it's strange that the online store is shutting down, you'd think the cost associated with the website would be minimal. Times must really be hard. thats sad, i guess this recession is really taking a toll!!! Gossip Girl--I Totally Get it Now!